UNITED NATIONS, September 1 -- At the "Friends of Libya" meeting in Paris on Thursday UN Secretary General Ban Ki-moon announced that his adviser on post conflict planning Ian Martin is headed to Tripoli. Ban did not say for how long, but UN insiders who contacted Inner City Press complained this indicates not only that Martin has entirely eclipsed mediator Abdul Ilah Al Khatib, but is nailing down the UN Libya Special Representative or pro-consul role. "Why someone from a NATO country?" one senior UN official asked Inner City Press. "Why the lack of Africans or Arabs on Martin's team?" 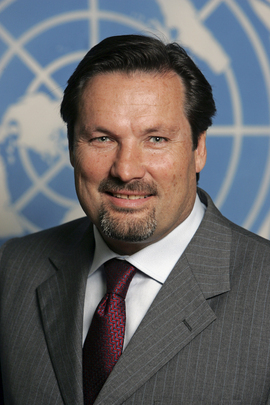 UN sources told Inner City Press that in line to be the Deputy Special Representative of the Secretary General, and Humanitarian Coordinator for Libya is a Finn, Georg Charpentier. One of Charpentier's selling points to Ban, beyond his need for a job after the UN was essentially thrown out Norht Sudan, is that Finland is not a NATO member. For that reason, too, sources tell Inner City Press that Finland was approached to provide troops under Martin's UN plan for Libya, exclusively obtained and published by Inner City Press. Inner City Press has previously covered and met Charpentier, most recently during a trip to Sudan during which Charpentier was downplaying the destruction of villages in Darfur. That he would now be sent to Libya may reflect his personal connections, but speaks badly of the Ban administration, even as to geographic balance. But in the Dubai airport on the way back to New York, Inner City Press managed to ask two Permanent Five members of the Security Council if Charpentier had mentiones this village destruction to them. One said plainly, 'no.'" Georg Charpentier: UN deputy pro consul for Libya cover up? As previously reported, because those Security Council members dubious of the current Libya goldrush have chosen to call for more UN involvement as a way to try to limit NATO's role, they are hard pressed to publicly criticize Martin's statement in his report to Ban that NATO will have a continuing role in Libya even after Gaddafi's fall. Therefore for now the only check on le projet Martin is the National Transitional Council. Among their ranks are some UN experts, including tenth-hour defector Shalgam and the political coordinator during Gaddafi's Libya's recent time on the Security Council. Will they hold Martin in check? We'll see.